A decade ago, Caterpillar Inc. looked at its employee drug plan and sensed that money was evaporating. The bills for pills had increased inexorably, so the company started to rein in its pharmacy benefit manager, or PBM. The managers are middlemen with murky incentives behind their decisions about which drugs to cover, where they’re sold, and for how much. In a decade when the average American’s drug spending has spiraled higher, the figure has fallen at the company. By hiring its own doctors and pharmacists, among other changes, Caterpillar has saved tens of millions of dollars a year. “The model is as successful today as it’s ever been,” says Todd Bisping, a global benefits manager at the company. Caterpillar’s experiment raises tough questions about a market that President Donald Trump recently slammed for “astronomical” prices. Pharmacy benefit managers process prescriptions for insurers and negotiate with manufacturers on one end and pharmacies on the other. The three biggest—Express Scripts Holding, OptumRx (a unit of insurer UnitedHealth Group), and CVS Health—process about 70 percent of the nation’s prescriptions, according to Pembroke Consulting. In the U.S., $15 of every $100 spent on brand-name drugs goes to middlemen, estimates Ravi Mehrotra, a partner at MTS Health Partners, a New York investment bank. 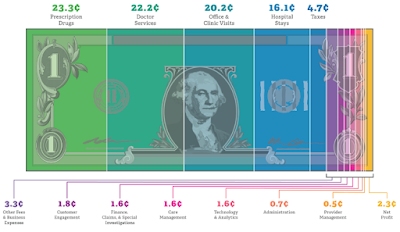 The largest share, about $8, goes to benefit managers. In other developed countries, only $4 out of every $100 goes to middlemen, he says. 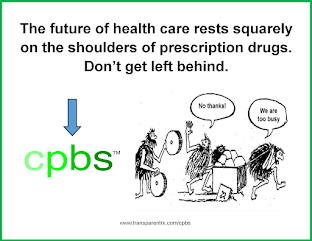 PBMs popped up in the late 1960s as payment processors. They now draft medication menus and negotiate prices behind the scenes with drugstores, health plans, and manufacturers. 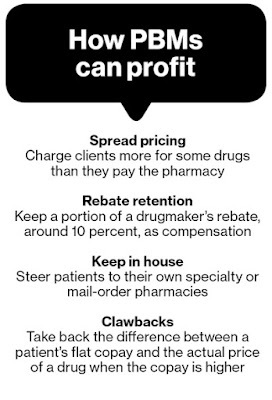 As their role expanded, so did ways to make money: Benefit managers keep about 10 percent of the rebates from manufacturers vying to get their medicines covered; they sometimes charge health-plan clients more for generics than they reimburse the pharmacies dispensing them; and they channel clients to their own specialty or mail-order pharmacies. 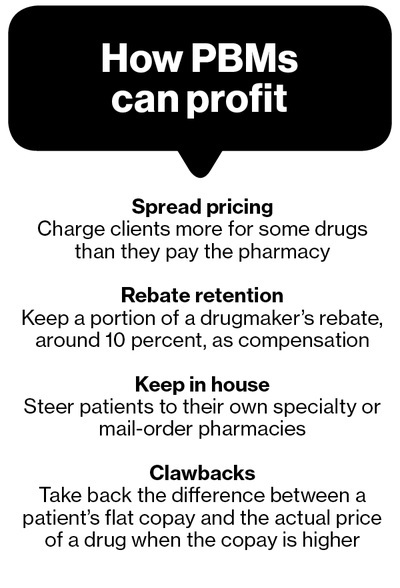 PBMs say they vary terms to suit client needs. While the terms are agreed to in contracts, they aren’t always well-understood by clients.